Holy smokes, we’ve had a lot of apples this year. 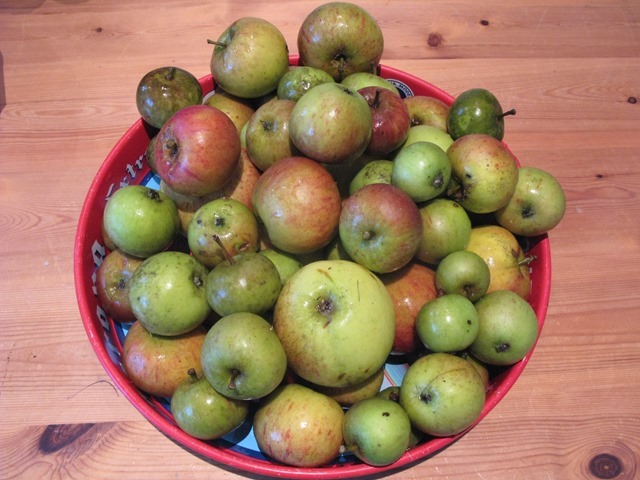 We’re the proud adoptive parents of three gnarled apple trees, and as opposed to last year, when the harvest was limited to just ONE apple on a twig, we’ve been inundated with bounty this autumn. But the thing is, life’s too short to be peeling and chopping mountains of fruit, and I can’t be bothered to do it, as much as I love a good crumble or pie. Neither my husband or I eat jam (we don’t shun it, we’re just not fussed about it), so I’m hardly going to be blitzing all the apples into spreads. And we have a lot of chutney to get through, so that option is out too. The best thing for us, we decided, was to turn all these apples into raw juice. 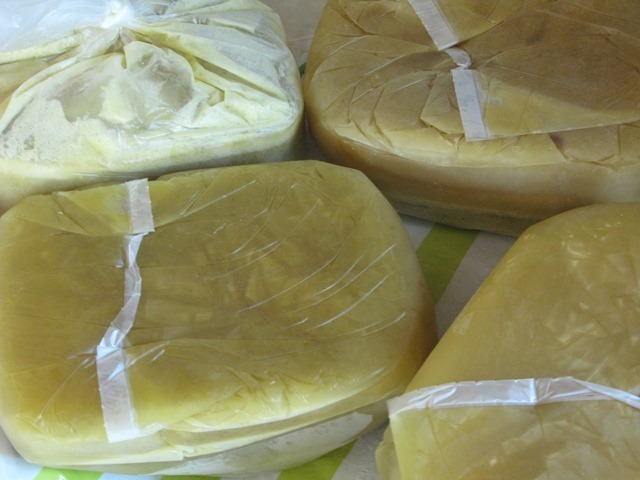 No peeling or coring, just pulverising them through a juicer. Very therapeutic. 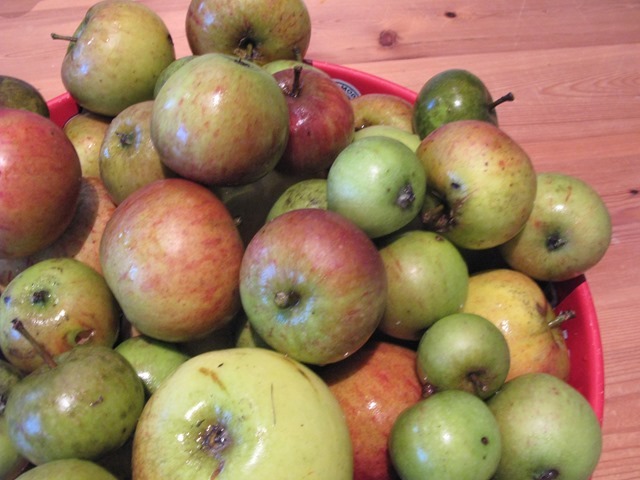 One issue with our crop is that the majority of apples are a bit bird pecked or have bruises on from being windfalls, and many of them are a little on the small side to make good eating apples – juicing is a great way to get the most from a motley crew of less-than-perfect specimens.We also didn’t like the idea of pasteurising the juice to store it in bottles, because you essentially kill most of the nutrients in the juice by flash heating it. 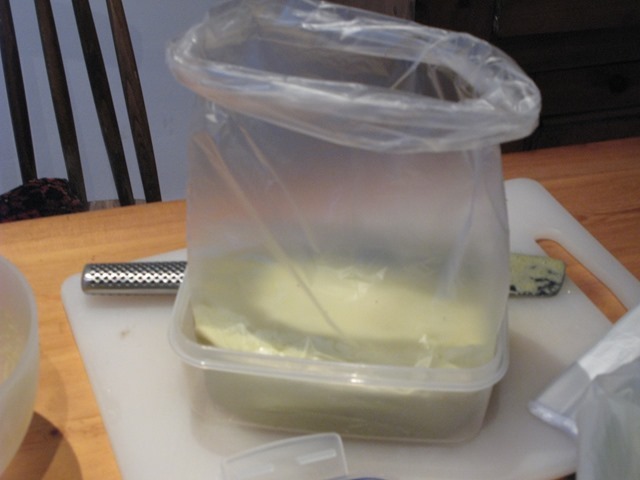 So the best option was to freeze it – you keep all the nutrients intact if you freeze the juice the moment it comes out of the machine. 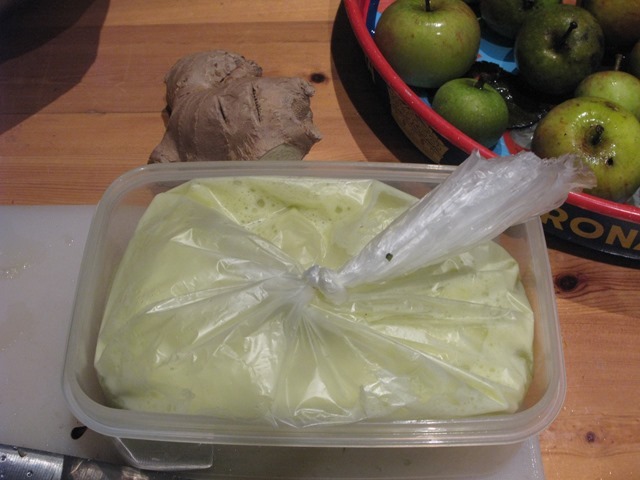 I discovered that the way to pack the most juice into the spare space in the freezer was to freeze it in ‘bricks’ – pouring it into bags inside brick-shaped Tupperware containers, then freezing it and lifting it out when solid, stacking it in brick piles to get as much efficiency from the space. 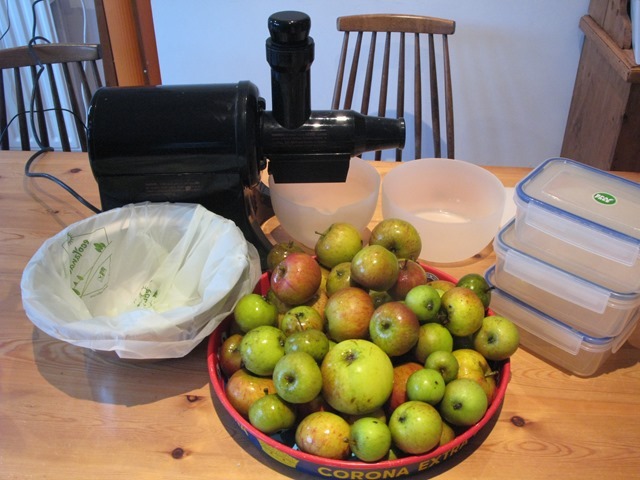 I’m not finished juicing yet – have about another 10kg of apples to go. 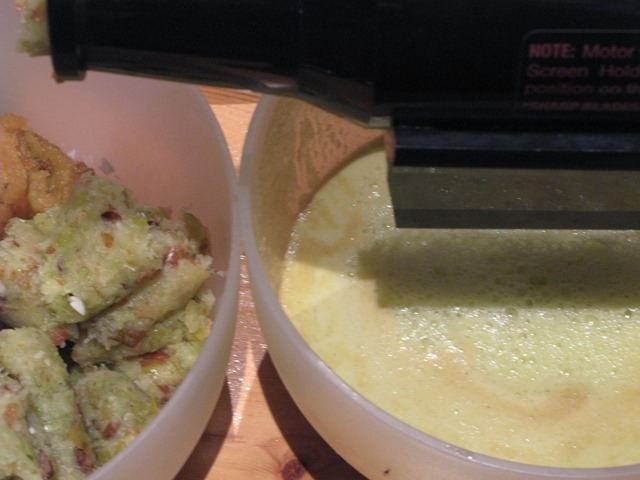 I’ve been adding a lump of ginger to each batch, to give the juice a bit of a kick. I’ll be feeling as smug as Gwynnie Paltrow when it’s all done, as will have enough raw juice to last me through the winter. Not got a juicer? Borrow one from a friend – so many people get given them and put them at the back of a cupboard. A shame, because a juicer is a rocking piece of kitchen kit! You can also make a rather wonderful cocktail by mixing some fresh apple juice, soda water, a squeeze of lime and some gin* together. Serve in big tumblers over ice. Feels like a health drink. Unless you drink 15 of them. * I was kindly sent some Martin Miller’s gin and used that – it’s nice and smooth, without that oily rush of bitterness you get with some other gins. Don’t freeze them, make cider. My friend has been making his own and it’s really quite good. I’m going to make some at my parents with all their windfalls.